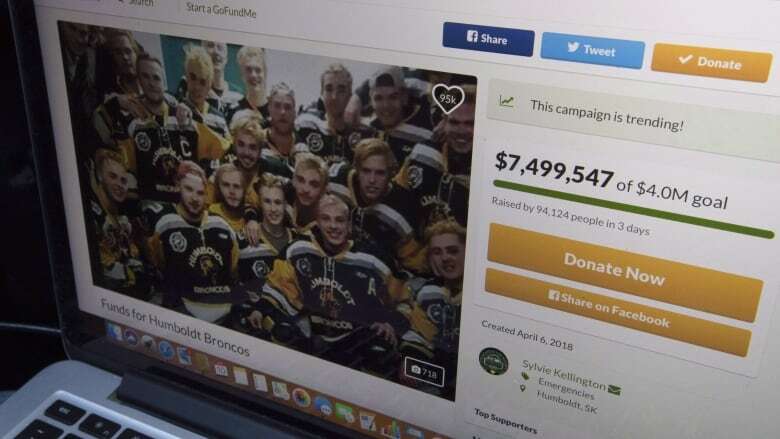 A court hearing related to money raised following the Humboldt Broncos bus crash will be the first real test of Saskatchewan's efforts to regulate crowdfunding campaigns, says a lawyer for the fund. The Humboldt Broncos Memorial Fund Inc. is to ask Saskatchewan Court of Queen's Bench on Wednesday for an initial order that would declare a GoFundMe campaign a public appeal, authorize the money to be held in trust and approve an interim payment of $50,000 each to the 13 survivors and the families of the 16 people who died after the April 6 crash. "This is a new law that was enacted in Saskatchewan in 2015," said Jeff Lee, a lawyer who represents the Humboldt Broncos Memorial Fund Inc.
"Saskatchewan was the only province that stepped up and actually enacted that statute into law and this would be the first occasion in which it's been considered in court," said Lee. Some have expressed concerns that the courts could take too long, but Lee said that's why there will be a request for an interim payment. "Everybody says, that's terrible, that's the most awful thing that's happened — I should help out with that," he said. "So what does that mean? How are they going to be helped? Is there a differential for survivors and non-survivors or families? What can it be used for? How much of it can be used? "Somebody has to take responsibility for doing all of that. Otherwise it's just total chaos." Lown, who's also a retired law professor at the University of Alberta, said courts can act as guides by introducing "some structure without suffocating it and without turning it into a long process of litigation." It would be made up of retired Saskatchewan justice Dennis Ball; Mark Chipman, chairman of the company that owns the NHL's Winnipeg Jets; Olympic gold medallist Hayley Wickenheiser; Dr. Peter Spafford, who's in charge of head and neck surgery at the University of Saskatchewan's College of Medicine; and Kevin Cameron, executive director of the Canadian Centre for Threat Assessment and Trauma Response.